Guest post by John Quayle, marketing and graphic design professional in the greater Pittsburgh area. Over the past ten months, I've dedicated a significant portion of my time and energy to attend networking events in the city of Pittsburgh. Not only did I want to expand my business network, but also had a strong desire to see how others were spending their time away from work. 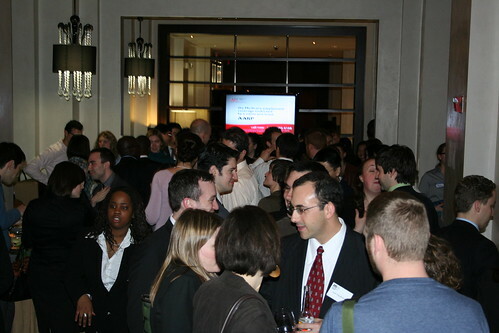 With the help of twitter, I began to attend various group's happy hours, meet ups, conferences, and other special events. To be completely honest, I can't remember how many people I introduced myself to or had a conversation with. A sea of names, faces, and events had over populated on my calendar. Before I knew it, I had accumulated a small mountain of business cards and wasn't sure how to capitalize on the connections I had made. To make matters worse, some of the people I met during these events I never saw again. It became apparent that I needed a way to scale down the list of new connections I wanted to keep in contact with. Therefore, I began to implement what I call the "Two-Ap (two appearance)" test when it comes to networking. This new test significantly helped me organize and appropriately determine who were the best people to keep in touch with. As I would meet new faces for the first time, I quickly made a note of when and where I met them. In the following six weeks or so, I would see if I crossed paths with them again at a similar event. If I did, their information rose to a higher position on my "keep in touch" list. And as you could probably guess, the more times I saw a specific person, the more they became part of my close networking list. For those I never saw again, I put their business card or contact information inside of a shoebox - only to be opened when needed. After four months of using the adopted system, I've come to believe in it as a great way to help me focus my networking energy after meeting someone for the first time. Not only have I learned about events and have had great experiences from those who are on the top of my list, I even started a breakfast networking event of my own (and for those wondering, I use the Two-Ap test for all the people that come to the events I organize). What can the Two-Ap test do for you? If you're unsure of how to manage all the new connections you've made, try setting up a similar test. I've come to notice that the more times you see a person organically, the more committed they are to networking and organizing events for the community that you live in. And if you make a solid effort in trying to get to know and help that person, new opportunities and connections will come to you. The last thing any true networker will want to do is squander all of their time away making connections that don't seem to last very long. Once you organize and nurture the top of your own "keep in touch" list, you'll find that the craziness of maintaining connections will subside into something that anyone can control. The more you network, the more you will come to find that people come and go. Hopefully, this “Two-Ap” test will help you better navigate the sea of new faces and connections.